It’s been a pretty decent week. No big issues. Part of me is irritated at myself for not being overjoyed at this. I really DON’T want issues. I really really don’t. But I’ve never been very good at waiting. And this waiting is the WORST. I’ve already expressed in previous posts the fact that this wait is one of 1.) waiting for Annabelle to get worse and 2.) waiting for another baby to die. I’m waiting on both of those things at the moment, and it STINKS. It just really does. And I’m tired of waiting. I really am. I’m sorry if this sounds depressing, but well, there it is. God is still on His throne. He hasn’t forgotten the Phillips’ family here at Vanderbilt Children’s Hospital. He hasn’t forgotten Annabelle. He knows our pain and feels it too. When I was 16, my parents moved my little brother and I to Minnesota. I HATED IT. 4 adults, 4 kids, 2 dogs, in a one-bedroom VERY small A-frame with one bathroom. NO running water, 45 minutes from civilization and 3 foot of snow on the ground in April. Anyway… we lived on a big plot of land far away from a town. My cousin and I decided one day to take a walk. He had gone to school for a month right after we moved in… I homeschooled the rest of the year so had never been to the school. He said it was an easy walk, maybe a mile or two, down the very deserted highway. Personally, I was VERY out of shape so a mile there and back seemed like a REALLY long way. But I was bored, so agreed. We geared up with our tennis shoes, comfy clothes to walk in, water bottles full of cold water, and told his mom that we were taking a walk (we didn’t mention WHERE we were walking), and off we went. Please keep in mind, there is nothing but trees between our property and the school. We walked for a while, being silly, talking about how much we hated being in Minnesota (we nicknamed it Frozen Hell… I know, not nice, but we were teens… MAD teens…), and how stupid our parents were. Normal teenage stuff, ya know! We didn’t drink any of our water bottles, because we wanted to save them for the way back. On we walked… and walked… and walked. We were both drenched in sweat, and I was wondering just how far this stupid school was. Finally we decided to give in and have a drink of water. TOO LATE. Water was hot. I mean REALLY hot. Hope renewed, we walked a little faster, anxious to get to water. And again, nothing except another curve in the distance. Jason was lucky he didn’t get punched. Eventually we came to an old abandoned schoolhouse, which Jason said he had forgotten about, and it was right before the school. WOOHOO. But we rounded another curve… and again, trees as far as we could see. Jason walked a little less closely to me at that point. Eventually, after we were both sunburned, dehydrated, and delirious (you know those silly cartoons/movies where they see mirage’s in the distance??? Yep, that’s about where we were! ), the school appeared. We burst through the doors, which were open even though it was summer, a true God thing, and parked ourselves underneath the water fountains for about five minutes. Then we borrowed a phone and called for someone to pick us up. Lesson: Keep going. Don’t give up. You never know what the curve ahead will hold. We tracked the miles on the way home… it was over 6 miles. Maybe this isn’t a lot to some of you, but to that overweight 16-yr-old who was nervous at the though of walking a mile (and considering it was probably the hottest day of the summer for Minnesota and we had no *cold* water…) it might as well have been 100 miles. AND… that overweight 16-yr-old ended up losing a LOT of weight in MN… and I credit that first 6 mile walk for a lot of it! I went from a size 14 to a size 8 in a year. Unfortunately 4 kiddos and 8 months of stress eating later… yeah, we won’t mention pants sizes now! Anyway, that’s where I am right now. We are walking this heart transplant road… I’m questioning even starting out on it, and I’m tired. I just want to be back home with my family, my WHOLE family, and recharge. Some (including myself lately!) might question God … why didn’t you warn me the journey would be this long? Didn’t you know? How could you make my family, my Annabelle, suffer like this? But thinking back to that walk JayJay and I went on, the thing that kept us going was the prospect of the end being just around the corner. If we had known how long it was going to be at the beginning, we would have given up and turned back at the first hint of sore muscles or thirst. And we would have been defeated… missed out on our victory. Maybe that’s why God doesn’t give us the road-map of life. Life, as we all know, can be hard. If we knew everything before it started, knew how long the hardship would last, would we really be better off? And if we went through life, everything being flowers and roses and no suffering, would we really be better off? Personally, I think we’d be a bunch of overweight, weaklings who never get to taste victory, that never get to feel the exhilaration of hard work and endurance paying off. And it’d be pretty boring. I sit here today, tired and worn out. My spirit is weak, my family is dragging, and Annabelle’s heart is struggling. But there is a curve up ahead, so we’ll walk on. We’ll keep going. Because victory is just right up ahead.. around the curve. Such a great post! I will be praying for you and your family, for perseverance, peace and strength. But trust in the LORD. Seek His Kingdom and righteousness first, do not worry for your time is in the LORD's mighty hands and he is forever faithful. We give you Praise and Thanks O LORD our GOD for you are good, and your Love endures forever. Thank you LORD for answering our prayers. for it is also written when 2-3 pray it is DONE! THank you, we pray all in JESUS precious name. Thank you father for you come when we feel at our weakess. To give us strength. We love you Krista. Thank you for sharing your family with us. many more blessing to you. Hi Krista, I have been following your blog for a good while now and praying for your beautiful baby girl to get her heart. I feel your hurt, frustration, humor, gratefulness for another day with your baby, irritation that it goes on longer, etc. I have been on a similar path as you. My son, who is 7 now did not leave the hospital the first time until he was 6 months old. Totally different issues (his being the loss of 60% of his small bowel, prematurity, all sorts of GI complications, respiratory issues, lung collapses, etc. the list could go on), but I think the emotions are the same. I also dealt with my situation with humor. Thank goodness that God has a sense of humor and imparts that gift to many of us!! You are soooo right about the waiting thing! Didn't take me too long to adapt to hearing good news or bad news without too much excitement or anxiety, but the times that we had to just sit and wait were worse. I remember driving to the hospital one day bawling my eyes out that things just wouldn't get any better and often seemed to only get worse(I had seen a few babies die and I was expecting the same thing with each episode my son had)…then it hit me–today is a new day and I am so very THANKFUL that my child is still at the hospital where I can visit and hold him–because I knew that some mothers I had met were having to go to the cemetary to visit their children. Many people don't understand this, but I know that you do. I love reading your blogs and seeing the pics of your baby. She is beautiful just like her sisters. It is amazing how the Lord can sustain us through unimaginable circumstances!! He is awesome!! Watching your child suffer is the worst thing ever. I remember getting to the point that I told Him just to take Joshua because his suffering was so great and it just needed to stop…I couldn't watch it anymore. Well, that obviously was not his plan and I am so happy that it wasn't, but then I had peace with whatever happened. I completely understand your pleight. My son is now an active 7yr old, is still fed 12hrs a day through a g-tube, is deaf (but hears and speaks with the use of a cochlear implant), and has many system malfunctions not limited to his GI system, is on many meds on a dosing schedule of 5 times a day and still has many doctor appts. A nurse attends school with him.I prayed every day that God would protect his brain–and that he did! inspite of a brain bleed, several episodes of asphyxia and apgars of 0 & 4. THe good thing is that as God loving mothers we get to sit in the front seat of God's miracle ride and see His amazing power and provision for our every need firsthand!! What an awesome experience. When I look back at the times that I thought he had abandoned me and my son, I realize that He was there all along teaching me new things and giving me a new perspective. Cling to Him and hang in there! You encourage me just reading your blogs and I know exactly where your strength comes from, cause I was there, and STILL am there! Praying for your family and heart day for Annabelle! Krissy…I am crying tears of every emotion…I love you!! You are an amazing sister, Mom and Wife…maybe not such an amazing cousin…LOL!! I'm going to tell Jay Ray he HAS to read this! Absolutely beautifully written! Thanks for the reminder! Oh, Krista, what inspiring words. The fact that you're walking such a long, hard road now makes the words even more powerful. We continue to pray for strength for you, Annabelle and the rest of the family, as you wait. May God bless you and renew your strength as you wait upon Him. May you soar with wings as eagles. May you run and not grow weary. May you walk and not faint. I kind of more or less "stumbled" onto your blog. My daughter's heart day was April 12, 2011 and her and I hang out each day now in isolation with not much to do. The steroids she is on leave her pretty much sleepless, so sometimes I find myself at night sitting in the dark with the computer, next to her crib, in hopes that sleep will come soon. smile. I am not complaining! Tonight I was looking for some less intimidating info on heart transplants….I want to find t-shirts for our family to wear when we go home…….transplant awareness type of thing I suppose. I am still not even sure WHEN we will go home….we too are dealing with lung issues. We knew going into the transplant that this was a possibility because our daughter(Ahsya) had such high pressures in her lungs. Her left lung collapsed twice and they postponed intubation….twice. We are currently "residing" at A.I. DuPont Hosptital for Children in Wilmington, DE. We have been here since the beginning of December. I haven't read all your posts, but what I read sounds so familiar!! It is quite a journey…………one I would not have picked, yet one that I would not trade!! My husband and I have 3 teenage boys, our daughter was diagnoses with her heart condition at 9 days old and has been on medication—with us knowing she would most likely need this transplant—since then. This little miracle princess girl was our foster daughter…..we were delighted in May of 2010 when we learned she was going to placed for adoption and we were asked if we would be an adoptive resource. Of course our answer was YES!! We were told that in Jan of 2011 that there would be a court hearing that would terminate parental rights and then we could file our adoption petition. Ahsya ended up in the hospital in December, then in the beginning of Jan there was some mix up with the judges and a law firm and our case was given to another judge who postponed the hearing till the end of March. We were so disapointed, as it seemed to have to wait for 2 things was more than we could stand. We were told the average stay in hospital while waiting for transplant was 4-6 montyh but could take up to a yr. Ahsya's heart came one day shy of a 4 month wait. 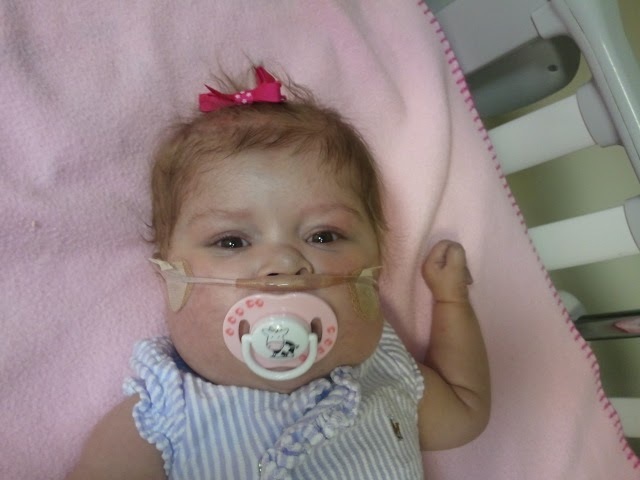 BUT….her adoption was complete 5 days before her heart transplant…..ONE DAY after parentaly rights were terminated. The judge fully understood the need for her to have someone legally sign consent for surgery should a heart be offered….and he made it clear he would not be the cause of her not getting it…..which proved to be a wise decision!!! At any rate…just wanted to share a bit about our story….I will probably keep reading your blogs as time permits….if you are interested and time permits on your end….I would love to be in contact. I wanted to say that I was more than pleasantly surprised to find not too far into my reading that believe in the goodness and Sovereignty of GOD!!! I don't know how we would have gotten through any of this without Him, without the power and presence of the Holy Spirit—without the name of Jesus to hold on to!!! Hang on….help is on the way! !